Monica et Chandler. . Wallpaper and background images in the Monica et Chandler club tagged: monica geller chandler bing mondler tumblr fan art. 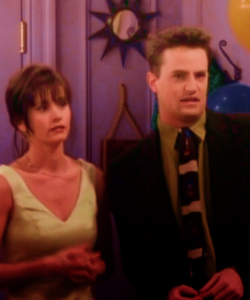 This Monica et Chandler fan art contains costume d'affaires and costume d’affaires. There might also be costume, costume de vêtements, costume trois pièces, costume mou, maillot de bain, and costume de mou.